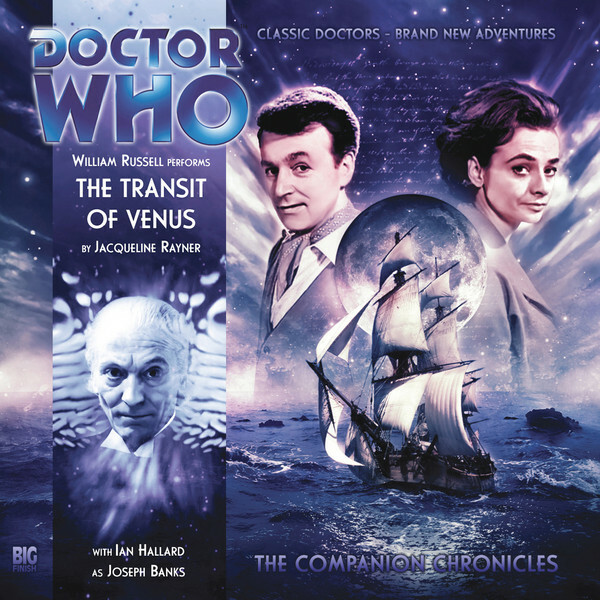 Back to the First Doctor era, but this time we hear a tale from Ian's point of view. The Doctor has had enough with Ian and Barbara. He orders them off 'his' ship at the next landing. When they leave the ship, they find themselves on a ship with the crew surrounding them. Believing they're demons, the crew attacks them. The last thing Ian sees is the Tardis being pushed over the side. I love historicals! Ian and the Doctor are stranded aboard Captain Cook's ship on its way to discover Australia. The look back at history is tarnished only by a few things. Its reliance on the classic series episode The Sensorites could hinder your enjoyment, if you haven't seen it. It also has some plot twists that seem really strange when they occur, but actually make sense by the end. Ian Chesterton is a scientist and former science teacher. In his old age, he enjoys recalling his adventures with the Doctor. This audio focuses on his reliance on Barbara for strength and back up. For the first time he must deal with being out of time on his own. In his loneliness, Ian struggles with madness and doubt. The First Doctor is more a distracted scientist, but he has his own issues to deal with. This story occurs immediately after one of the Doctor's most hot tempered and contemptible moments. As a result, we get to look at why he reacts so grumpily during his early adventures. Barbara Wright is treated as an almost angelic being. This is a great spotlight on one of the more subtly strong characters in all of science fiction. The fact that this is accomplished with little to no appearance in the story is an awesome feat. Susan Foreman doesn't appear too much, but does have an indirect impact on the story. She was good with what little she had. Captain Cook is a fair and just captain trying to deal with the strange occurrences around him. Despite their initial friendship, his patience is tried as Ian's madness grows worse. Joseph Banks is the expedition botanist. He seems friendly enough, but he soon quotes Coleridge's Rhyme of the Ancient Mariner that won't be written for over thirty years. Ian struggles to determine if Banks was replaced by an alien or if he's another time traveler. He could be almost anything. Listening to this adventure really makes you feel the isolation of being aboard a ship with stops only on interesting but strange isles. The end delivers a great explanation of some of the strange quirks of this tale. The insight given into this first cast of characters is really fantastic. The original crew of the Tardis had the most historical adventures and this returns to that era in fine form. I always love it when the Companion Chronicles use both the strength of this character driven format in addition to the style of a classic tale. This is a must listen to for classic series Doctor Who fans.